In September I wrote about this lady I see in my neighborhood to whom I refer to as “Sunscreen Lady“. Well, there’s this other woman. What can I call her… Let me think. How about “Big Brother Lady”? Yep, she thinks she’s being watched. By the MTA. Okay we all are being tracked somehow. But she is very active about letting the MTA know that she knows that they know about her knowing about what they know … oy. I’ve seen her three times. Three times is a lot in this city, considering the number of people. Twice on city buses and again last Friday in Grand Central on the 4, 5, 6 platform. She has these rectangular signs – paper, cardboard, and envelopes – that I assume she writes messages on … She displays her messages – none of which I’ve seen – to the video surveillance cameras in the buses and in the subway stations, mouthing words to the camera as she points to her signs. As she is showing the camera her signs, she is oblivious to others around her – like no one is there but her – which is kind of strange considering she thinks she is being watched. Anyway, is it rude for me to look at her messages? 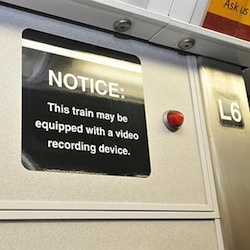 Not sure… but I guess if she’s sharing her messages to the video cameras, I can read them too? I’ll keep you posted if I see her again and pass on her message. P.S. Now you get my reference in my Wordless Wednesday post, right? Maybe she thinks she’s a contestant on the “Final Jeopardy” round? I’m not sure, but she sure takes it seriously!